One of our largest income producing fundraiser is held each spring--ANNUAL GOLF TOURNAMENT. 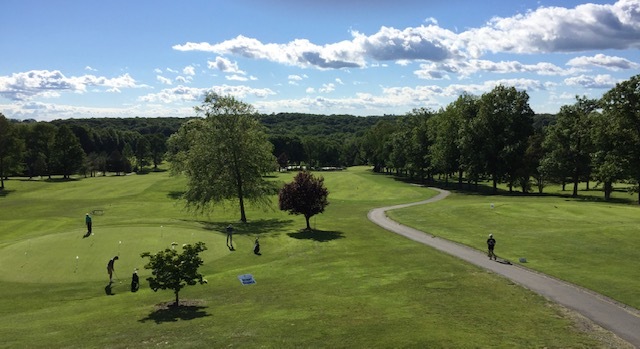 The 2019 tournament is JUNE 5th at the Ridgefield Golf Course with the rain date June 19th. The cost is $185 that includes green fees, cart, lunch, dinner and two drink tickets. There will be a helicopter ball drop after everyone is off the course. Prizes are awarded and raffle tickets are sold. It's a great day of fun and friendship. The Ridgefield Lions Club is a non-profit organization that supports the local community. The Lions Mission Statement is to create and foster a spirit of understanding among all people for humanitarian needs by providing voluntary services through community involvement and international cooperation. In 1925, Helen Keller challenged Lions to become "knights of the blind". Today Lions are recognized throughout the world for their service to the blind and visually impaired. We demonstrate our commitment to sight through eyeglass recycling, sight partnerships and numerous other sight service projects. The Lions motto is "We Serve"
Our Ridgefield Lions Club was formed April 19, 1929. Lions International is the largest service club in the world totaling over 1.4 million. If anyone is interested in joining our Ridgefield Club, please contact Lion MikeLiberta You can call him at 203-438-0726 or email him at : mj_liberta@msn.com. We are always looking for people to join us in our endeavor to help those less fortunate. Our club consists of both male and female members from all walks of life. We would love for you to join us at one of our meetings or events to see what we're all about. We only meet once a month for a dinner meeting and then have numerous fundraisers and service projects throughout the year. Please call or email Lion Mike for more information. THANK YOU FOR VISITING OUR SITE!!!!! !